APC, the leading global brand for integrated IT physical infrastructure and software, provides reliable power, and availability solutions for IT and communications technologies. With the largest community of partners tailoring solutions for home and business networks, APC products enable individuals and businesses to anticipate the unexpected, protecting critical information and data. It’s certainty in a connected world. APC is a brand of Schneider Electric, the global specialist in energy management and industrial automation. Schneider Electric helps customers in over 100 countries to manage their energy and process in ways that are safe, reliable, efficient, and sustainable. APC's UPS lifecycle recommendations can help maximize your UPS investments and ensure business-critical applications are always on. Learn more about the lifecycle of your UPS in this infographic! Click here to view full infographic.... sneak peek below! 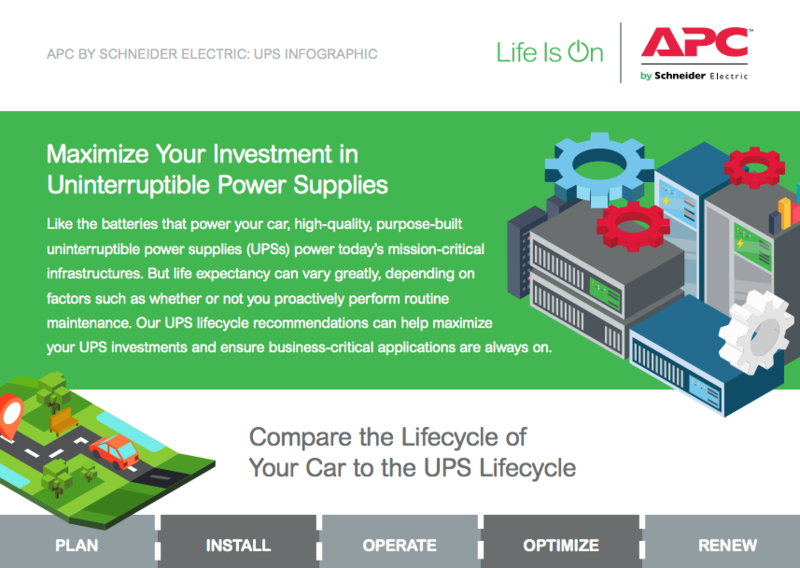 Compare the lifecycle of your car to your UPS's lifecycle. More innovation and leadership - from the worlds leader in data center physical infrastructure all while reducing cost!